Daniel "Boonie" Harjo, a resident of Tahlequah, Oklahoma, passed from this life on Saturday, January 19, 2019 in Tahlequah at the age of 58. "Boonie" was born on November 2, 1960 in Palo Alto, California to Marsey Harjo and Rosalie (Lewis) Harjo. Boonie grew up in California and attended school there, finishing his education at San Carlos High School. He was a lifelong Oakland A's baseball fan. In 1994, he married the love of his life, Herlinda Magana in Redwood City, California. He took great pride in helping to raise his stepson, offering his support as coach of his stepson's Tball and baseball teams. He also totally loved the time he got to spend with his grandsons, MJ and Oscar. Boonie loved being outdoors and was an avid fisherman. 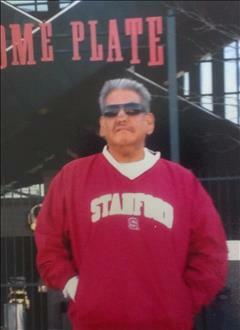 He was a longtime Stanford University athletics supporter and always cheered for the Cardinals. Affectionately known as "Uncle Boonie" to many of his family, he was a loving son, brother, father, husband, and grandfather and his family and many friends will miss him dearly. Boonie is preceded in death by his wife Herlinda; his mother and his father; and by two sisters, Naomi Harjo and Estelline Harjo. He is survived by his son, Manuel Magana of Santa Clara, CA; two grandchildren, Manuel "Junior" Magana and Oscar Magana, both of Santa Clara, CA; a sister, Sue Harjo of Shawnee, OK; a brother, Billy Joe Harjo of Kenwood, OK; and by 11 nieces and nephews, other extended family, and many good friends. Viewing for Boonie will be held from 1pm until 5pm on Thursday, January 24, 2019 at Integrity Funeral Service in Henryetta. Following cremation, a memorial service will be held at a later date in California. Integrity Funeral Service of Henryetta has been entrusted with the arrangements.